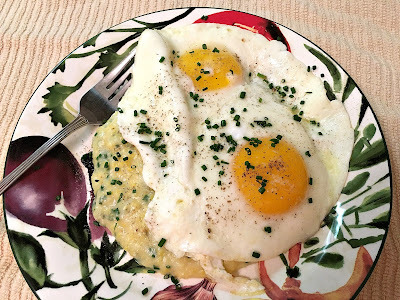 Here is a lovely breakfast to make when you don't have any bread or potatoes in the house and you want something to go along with your eggs. Although I grew up in Texas, I rarely encountered grits outside of literature. I had a vague idea of what they were but no idea how they tasted. On the rare occasion that I ran across them on a breakfast menu my eyes skipped right past them, not even considering them as an option. I believe I finally tried them at some greasy spoon and they were runny and tasteless so I never bothered with them again. And then I discovered polenta. And oh my, was it delicious! It was cheesy and buttery and had a mild undertone of corn. I fell in love with it and made it fairly often to go with eggplant and tomato sauce and later, black beans. It was not until quite a few years later that I finally decided to try grits again (here in Chicago, ironically enough) and ordered the cheesy grits to go with my fried eggs at a known "southern" brunch place (Wishbone North, if you must know, which apparently is a separate entity from the Wishbone in the south loop, judging by the separate wesites - I am sure there is a story there). And imagine my surprise as I realized that grits and polenta are essentially the same. Cornmeal and water. The difference is in how much water to cornmeal you use and what else you put in with them. But I continued to cook and eat polenta to go with lunch and dinner dishes and only had grits occasionally when I was out to brunch. And then one time I was at my brother's in Austin looking for breakfast and there was nothing to go with the eggs I was craving. And that is when it hit me that I could make a single serving of polenta and have my own version of grits and eggs. It worked well and I have since made it several times out of choice rather than out of desperation. And even though I am really making grits, I still call it polenta. The chives are completely optional and I used them because I had some in the refrigerator, but it would be worth it go get them just for this purpose. Bring water to a boil over high heat in a small saucepan. Stirring the water around to form an eddy, slowly add the cornmeal so it does not clump. Stir once more and turn the heat as low as it will go. Cook for 15 to 20 minutes, adding more water if necessary, until the polenta is thick and you can no longer see the individual grains. Season to taste with the salt and pepper. Add the cheese and the chives and stir everything together to combine. Remove from the heat and transfer to a plate immediately and let set for at least ten minutes before serving, about the time it would take to fry your eggs. Slide the fried eggs onto the polenta and top with additional chives before serving.